The CW's Legends of Tomorrow has been on a brief hiatus over the past few weeks, but will return Thursday, March 31 at 8 PM ET with Left Behind. 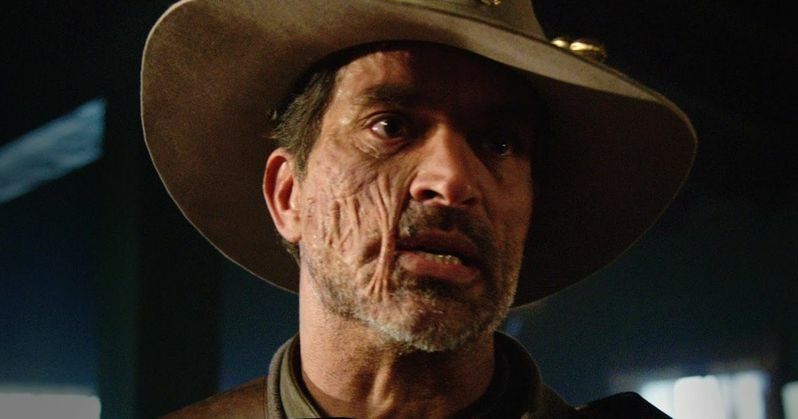 During the WonderCon convention in Los Angeles this weekend, The CW revealed a new trailer for the back half of Season 1, which gives us a new look at Johnathon Schaech as the iconic DC Comics character Jonah Hex. This footage also teases a few more surprises that fans can expect as the second season winds down to a close. Johnathon Schaech signed on to play Jonah Hex back in January, making his debut in the 11th episode, The Magnificent Eight, slated to air on Thursday, April 14. The character is described as "a true legend of the Old West," and a morally ambiguous gunslinger with a penchant for danger. Jonah is actually well-versed in time travel and the future, but is at home in the Wild West. He's been battling outlaws and gangs for a while now, and advises the team to be extra careful when they arrive in the small town of Salvation. The trailer also features Arrow's Felicity Smoak (Emily Bett Rickards), along with Ra's al Ghul (Matthew Nable), Nyssa al Ghul (Katrina Law) and our first look at a young Talia al Ghul, in scenes set in the past. It isn't known if these scenes will lead into a present-day or future version of Talia al Ghul, but it certainly seems likely. We also recently learned that the show is planning on introducing another important DC Comics character in the season finale. While the character hasn't been confirmed yet, there is speculation it could be Booster Gold who is introduce in the finale. The show is also expected to showcase other prominent comic book characters like Sgt. Rock, Ma Hunkel (aka the Golden Age version of Red Tornado), Hourman and Sandman, but we haven't been given any specifics as to when they may debut. There had been talk that each season of Legends of Tomorrow will feature a completely different cast of rotating heroes and villains, but that rumor was shot down earlier this month by TV Line's Michael Ausiello, who said "a wholesale cast change is not at all in the cards." Legends of Tomorrow was renewed for a second season earlier this month, and while it hasn't been revealed when the second season will premiere, it seems likely The CW will keep it in the Thursday 8 PM ET time slot for its second season. While we wait for more on the end of Legends of Tomorrow's first season, take a look at the trailer below, and stay tuned for more on this hit series. Are you looking forward to the debut of Jonah Hex on Legends of Tomorrow?